The Africa Sports Report brings you An Insight into Rugby in Africa with Outgoing President of the Continental Body Mr. Abdulaziz Bougja of Morocco on the eve of the Africa Continental Congress and Elections In Morocco ... He gets to respond to accusations against him in an Open Letter against him by his former Deputy and Vice President Paul Sigombe of Uganda. 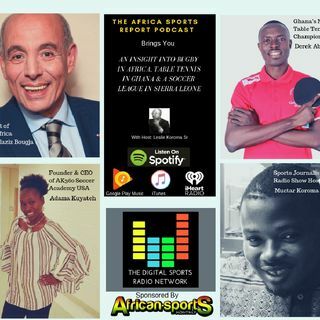 We explore Table Tennis in Ghana in an Interview with Ghana's Number 1 Table Tennis Player Derek Abrefa and take a deep look in a ... Maggiori informazioni Panel discussion on the current state of and an update of the ongoing Sierra Leone Premier League with Ms. Adama Kuyateh Founder and CEO of AK360 Soccer Academy in the USA and returning contributor and Sports Journalist in Sierra Leone Mr. Muctar Koroma.